Looking through my blog you can quickly notice that it mostly contains the good in the field of child life. Naturally, I am not a negative person thus I don’t highlight the bad – i.e., being called for support after 3 failed IV attempts, not having necessary resources to fulfill patient needs, getting a referral to “entertain” a patient. Though definitely annoying, there’s bad like this within any career in one way or another and it’s just something you learn how to handle. 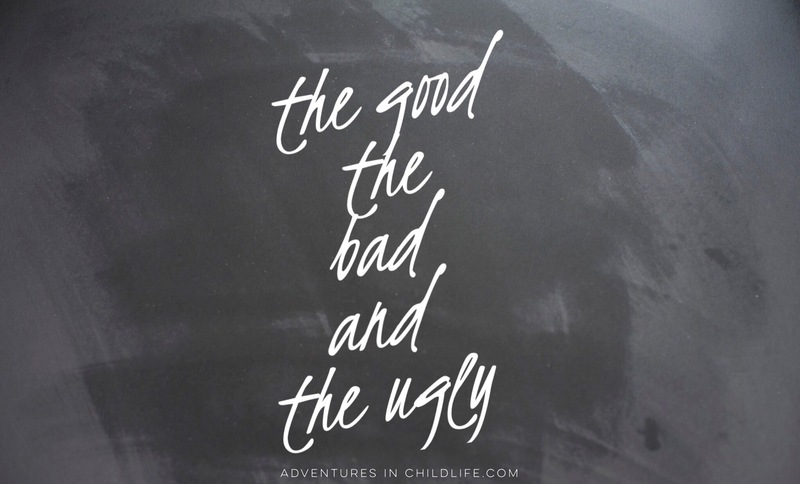 However, I’m going to take a deep breath and write this post about the ugly that I’ve experienced during my time as a CCLS – burnout. Some of you may remember that up until February of this year, I was working independently in a pediatric emergency department at a children’s hospital within an adult hospital. I began working there 1 month after my internship and had to quickly learn the ropes of the ER flow, culture, and procedures/diagnosis, as well as educate the staff on my role, advocate for resources I needed to fulfill patient needs, and personally adjust my life to being a new young professional! That is a lot for anyone and much more so for someone working in an independent child life program. I did not complain or see this part of my adventure as daunting – I was excited and ready to take on this challenge! This is what I had studied for. This is what I had done internships for. This was my calling. Day in and day out I juggled all of my new challenges and with sweat, tears, and so much love, I had successfully implemented my role as a CCLS amongst my ER team. I knew I was doing something right when the ER physicians would fight over who “got me” for their upcoming procedure;”You had her last time! My kid is terrified and I need her to help him be still for these sutures!” Music to any child life specialist’s ears, right? The needs of any emergency department call for more staff to be on shift in the later hours of the day which is when most patient’s visit the emergency room. That being said, my shift was from 3pm – 11pm, Monday through Friday, and every other weekend (Saturday and Sunday shift, same hours). Looking back, this was the poison that caused my burnout – my schedule. I began to feel desensitized towards my work and my interactions with patients and families began to seem routine. I felt as though I had reached a plateau in my clinical skills – I knew what I knew and what I didn’t know I didn’t have another CCLS to seek advice from so I didn’t feel I was growing. I’d spend entire shifts in and out of long procedures only to then be frowned upon by higher-ups because I had “only” seen x number of patients that day. As time went on I also felt I’d dwell on the little things (the bad) much more than I once would. I hated that I felt this way so early on in my career. I hated that I didn’t have another CCLS to speak to about professional and clinical issues I was facing. I hated that I didn’t have the support/understanding/resources from higher ups in my hospital. Most of all, I hated that I had to work the shift that I did and that it was poisoning my love for child life. My black cloud (schedule issue) was especially hard for me because everyone else in the department – physicians, nurses, ED techs, respiratory therapists, patient transporters, medical scribes, even my two child life assistants – they all worked 12-hour shifts! I was the only employee in the emergency department that worked 40 hours a week, odd hours, weekends, with direct patient care. I collected data, research articles, and proposals of ways I could alter my schedule (working four 10-hour shifts versus the current five 8 hour shifts) and presented this to my manager. Unfortunately, I was told my proposal did not meet the needs of the department and so no changes could be made. Now I know what you might be thinking (because I thought it too) – I signed up for this! Yes, I absolutely did and I was eager and ready to do so at the time. But after a year and a half of working 5 days a week in such a fast-paced and high-stress environment, it happened. I became burnt out. I did my research and unfortunately found lots of information on how to avoid burnout but very little on what to do when it actually happened. I was completely lost and disheartened – I knew I loved being a child life specialist. I loved the way I was able to help kids in crisis – I knew what to do, what to say, and I did it so well that physicians would wait their turn for me to help their patients. Maybe I should’ve posted on the child life forum about my burnout, maybe I should’ve presented my research and data to the director of the ER, maybe I should’ve found a new job before I ever even got to that point. The thing about burnout (for me at least) is that I didn’t realize it was happening until I was already down the rabbit hole and by that point, I didn’t have the passion or drive to try and get myself out. So how did I get myself out of burnout? I spent a LOT of time on the child life council’s web page searching the forum for data on emergency room child life hours, searching for the articles on burnout, and searching for the slightest indication that there was another CLS out there in the same predicament I was in. That’s when I found my cure – the child life council’s mentor/mentee program. I submitted my application and was accepted into this incredible program where I was partnered with a mentor – a veteran child life specialist! The way that the program works is that you highlight different areas that you would like support with. Then from January – June, you and your mentor have a monthly phone call (or meet in person if able) to discuss your issues. You’re also able to attend a monthly webinar which focus on different issues many may be facing (i.e., communication skills, leadership skills, etc.). I cannot begin to explain what an incredible impact this program had not only on my career but in my personal life as well. I finally had the support I had been craving all along and with it, I found my passion, drive, and confidence to be proactive towards my career goals. Fast forward to present day, I did end up leaving the emergency room as I felt it was very important for me to work as a part of a child life team. I am very thankful and still do feel blessed that I had the opportunity to spend two years in the ER. I wouldn’t trade it for the world! I truly learned so much about medicine, the importance of teamwork, and about myself. I’ll always miss my old department and especially all of the amazing people I worked alongside. Though I did hit a low while I was there, I have an abundance of positive memories of my first two years as a CCLS which outweigh the bad and the ugly in hindsight. Thanks for sharing! I, too, feel the same way and have gone through the same path as you. I am still in the ER, but trying to look for ways to keep my passion alive! Makes me feel better that someone has gone through the same thing! Oh my word. Thank you, thank you for posting this. I am in the process of becoming a CCLS and I am terrified already of the burn out. I’m so glad you posted this.